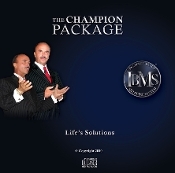 Downloadable -Dr. Coldwell's IBMS Life's Solutions. This CD is 3 of 3 CD's in The Champion Package. Purchase this download individually $34.95. This is 3 of 3 CD's in the Champion Package.